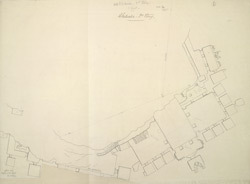 Plan showing sections of Cave V (left) and Cave VI (right) at Ellora from James Burgess' 'Original Drawings [from the] Report on the Elura Caves.' The spectacular site of Ellora, in Maharashtra, is famous for its series of Hindu, Buddhist and Jain cave temples excavated into the rocky façade of a cliff of basalt. The works were done under the patronage of the Kalachuri, the Chalukya and the Rashtrakuta dynasties between the 6th and the 9th centuries. Cave V and Cave VI are both Buddhist caves dating from the 7th century used as viharas (monasteries) and are situated on the south end of Ellora. Cave V has a long spacious hall and several residential cells. A key feature of Cave V are the two long lines of benches carved out of the floor which were probably intended for the use of the monks when studying or dining. Cave VI consists of a central hall, two side halls, an antechamber, a main shrine, as well as several cells along the sides of the monastery. Several key figures featured in this cave include Tara and the Bodhisattva Avalokitesvara.